Call it the scotch working overtime, but my ears pricked up during a party I was at last week when I heard a woman state “It’s so important to teach kids tolerance in this day and age”. Something didn’t quite sound right with that. So I refilled my glass and sat back to listen in on her talking animatedly about the challenges that we face in a culturally diverse society and that tolerance is what is needed. 10 minutes later, I was convinced – Tolerance is a “negative” concept. Let me ask you something… Think of a person you really like – a friend, relative, anybody that you’re fond of. Do you tolerate them? Or love them? Why don’t you ever say this about your loved one “Oh, I tolerate my boyfriend just fine”. 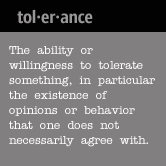 When do we tend to use the term “tolerate”? We use it in the presence of people we can’t stand, but simply have to put up with. For example, you might say “I can barely tolerate my boyfriend’s buddies” or “I can’t tolerate my mother-in-law anymore”. I can go on….. but I’m sure you see where I’m going with this. We tend to consider tolerance as a good word. Heck, we’re teaching this stuff to our kids in school. The word has the aura of peace, understanding and cohesiveness in society. Yet our language betrays the word’s real meaning to us. The opposite of tolerance isn’t intolerance…. its understanding. Where tolerance urges us to keep our opinions (of people we don’t like) to ourselves, understanding pushes us to try and see where they are coming from. Isn’t that what this world needs? Our world is coming together at a stunning pace. We haven’t been exposed to so much cultural diversity in the past 50 years as we have in the past 10 years. And a lot of us don’t know how to handle it. We almost feel as if our identity is under threat and the natural instinct is to assume a position of “We” vs “Them”… anything that makes us better than the others. You can extend this to any situation – the workplace, family, anything. And as we can’t do anything about their presence, we tolerate them. What if we didn’t tolerate them? What if we tried to understand where the other people were coming from? What if we thought “They’re not idiots. Let me see what they’re trying to tell me”. When we’re no longer taking the refuge of a weak word which (ironically) makes us feel superior as well, that’s when we’ll see our paradigm change. The clumsy, geeky neighbor’s kid who’s always hanging around your kid’s toys may emerge to be a kid who looks for love wherever he can find it. The new immigrant with the funny accent at the office may emerge to be a brilliant strategist only if people would listen to him without laughing. And the beggar who bugs you for change may simply be a guy who’s given up on life. Heck, who are we to judge? So next time, don’t tolerate…. Understand!